It would be necessary on the occasion of a period of mourning to talk about its fashion: for the death of DON PEDRO, King of Portugal, we have furnished it. It has been worn for twenty-one days; we will say how when we have spoken of the periods of mourning according to our practice. Mourning (1), which is the mark of grief, and which draws its name from it, was worn and is worn by all civilized Peoples. It has not taken the same form in all; but in all it has the same object. The Women of Sparta and Rome wore it in white, and they varied it as we do, due to the temperaments that the times apportioned to sadness. It lasted an entire year. Men without a doubt wore their clothing in the same color; but they added other signs. The Greeks, in the manner of the Orientals, cut their hair; the Romans, to the contrary, grew theirs, with their beards. The Greeks did more; on the tombs of their parents and their friends, they not only cut their hair, but also the tails of their horses. They practiced the same ceremony in public calamities, after the loss of a battle. (1) Dolere, to be sorrowful, to grieve, to have heartache. Mourning was also worn in white, in Castile, on the death of Princes, until 1498, where black was taken on the death of Prince Don Juan. White is at present the color of mourning in China; blue or violet in Turkey; yellow in Egypt; light-grey in Ethiopia; and mouse grey in Peru. Each Nation had its reasons for choosing a certain particular color which indicates mourning. One supposes that white marks purity; yellow or dead leaf makes apparent that death is the end of human hopes and of life, because the leaves of trees, when they fall, and plants, when they are sere, become yellow; grey signifies the earth where the dead return; black marks the deprivation of life, because it is a deprivation of light; blue marks the happiness which it is hoped that the dead enjoy; and violet being a color of mixed blue and red, marks, on one hand, the tribulations of this life, and on the other, what one wishes for the dead. 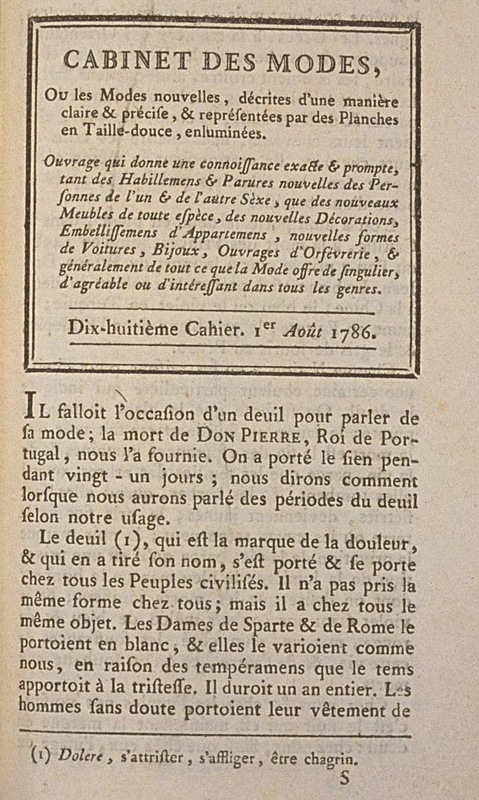 In our country and in the countries of the People our neighbors, it is black which is now the mark of mourning: in ours, as in theirs, the practice of mourning has not been known in all times; for it was not the same at the beginning of the reign of Philippe-Auguste. 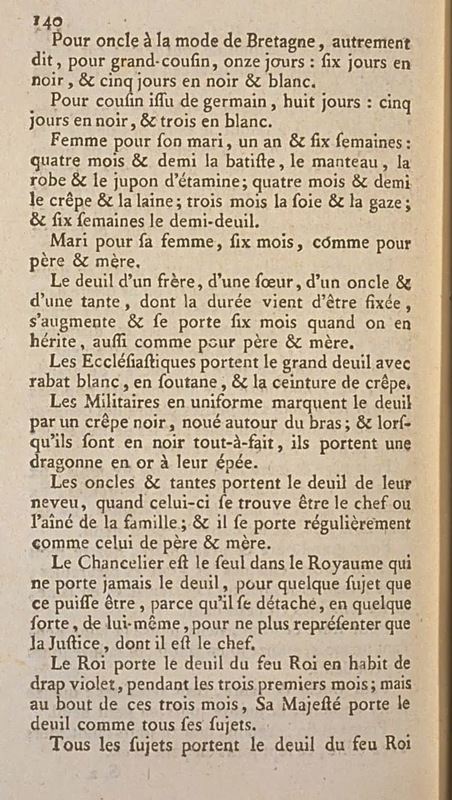 Since the Order given in 1716, by Louis XV, who reduced the time of mourning by half, and fixed its manners, so that great mourning was only made for one's father and mother, grandfather and grandmother, husband and wife, brother and sister. Great mourning is that which is split into three terms; wool, silk, and little mourning, or coupé coats. Other mourning is split into two terms; black and white. Drapery is never put up for this type of mourning. Whenever there is no drapery, women can wear diamonds, and men, the sword and silver buckles. In mourning for a father, mother, grandfather, grandmother, wife, men wear large and small pleureuses* during the first three weeks, and the little ones only during the following three. For father and mother mourning lasts six months: six weeks with large and small pleureuses, six weeks after the wool without pleureuses, six weeks silk, and six others of little mourning. For grandfather and grandmother, four and a half months: three weeks with large pleureuses, three weeks with small ones: six weeks in wool, and six weeks in little mourning. For brother and sister, two months: wool for a month, silk for fifteen days, and little mourning for fifteen days. For uncle and aunt, three weeks: fifteen days in wool, and fifteen days in little mourning. For a first cousin, fifteen days: eight days with effilé, and seven days in little mourning. For an uncle in the mode of Brittany, that is, a second cousin, eleven days: six days in black, and five days in black and white. For the child of a first cousin, eight days: five days in black, and three in white. 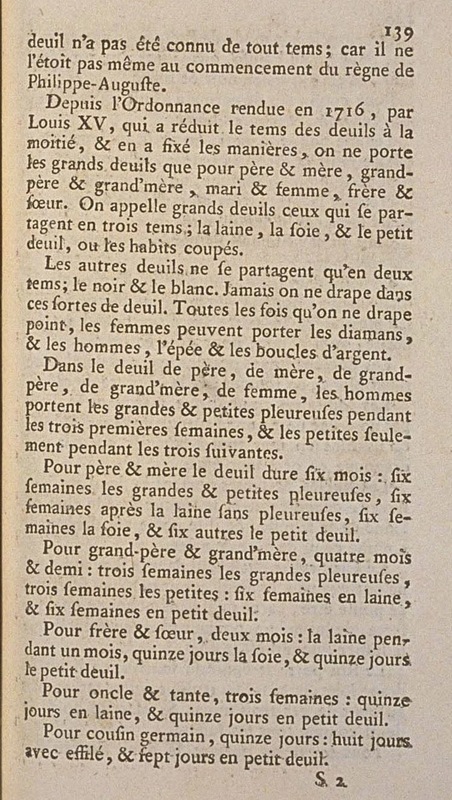 A wife for her husband, a year and six weeks: four and a half months the batiste, cape, gown, and petticoat of étamine; four and a half months in crêpe and wool; three months silk and gauze; and six weeks half-mourning. A husband for his wife, six months, as for father and mother. The mourning for a brother, a sister, and uncle, and an aunt, whose length has just been fixed, is augmented and worn for six months when one inherits from them, also for the father and mother. Ecclesiastics wear great mourning with a white rabat, a cassock and belt of crêpe. Military men in uniform mark mourning with a black crêpe, knotted around the arm; and when they are entirely in black, they wear a gold dragonne* on their sword. Uncles and aunts wear mourning for their nephew, when he is the head of the family; and it is worn regularly as that of the father and mother. The Chancellor is the only one in the Kingdom who never wears mourning, for whichever person that it may be, because he is detached, in some way, from himself, in order to only represent Justice, of which he is the head. The King wears mourning for the late King in a suit of violet wool, for the first three months; but at the end of the three months, His Majesty wears mourning like all his subjects. All subjects wear mourning for the late King as for the father and mother, and for the same period. When it is a foreign King, who is not the father of the Queen, or when it is a foreign Queen, who is not her mother, mourning is worn for twenty-one days, as thus for the King of Portugal. If the foreign King or Queen are the father or mother of the Queen, mourning is worn as for the late King of the Kingdom. 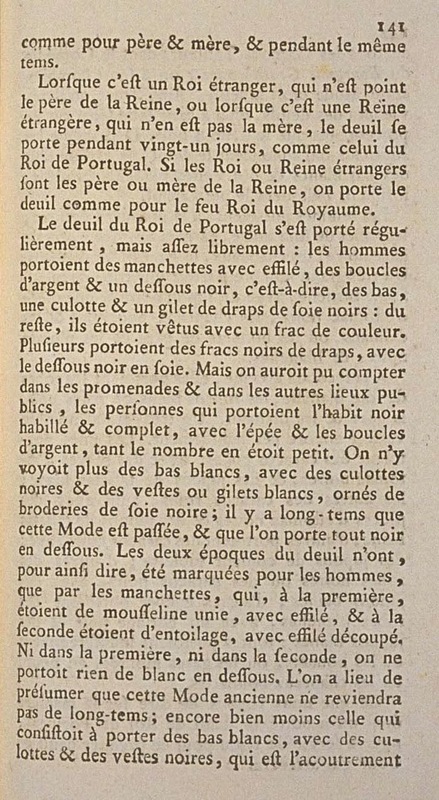 Mourning for the King of Portugal is worn regularly, but rather freely: men wear manchettes with effilé, silver buckles, and a black underside, that is to say, stockings, breeches, and waistcoat of black silk cloth: for the rest, they are dressed in a colored frock coat. Several wear black cloth frocks, with a black silk underside. But one had been able to count in the promenades and other public places, as many people who wore a fully dressed and complete black suit, with sword and silver buckles, as in an informal one. White stockings are no longer seen, with black breeches and white vests or gilets, decorated with embroidery of black silk; it has been a long time since this Fashion occurred, and since fully black undersides were worn. 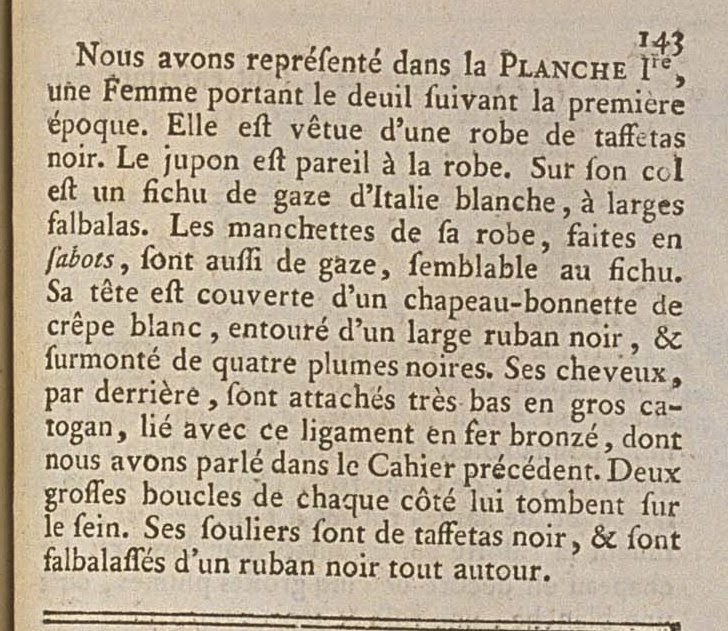 The two eras of mourning have not been, so to speak, observed by men, except in manchettes, which, in the first period, were of plain muslin, with effilé, and in the second were of entoilage, with pinked effilé. Neither in the first, nor in the second, was anything white worn on the underside. One has reason to presume that this ancient Fashion will not come back for a long time; even less than that which consisted of wearing white stockings, with black breeches and vests, which is the accoutrement of all the Apprentice Tailors in the Comedy of the Bourgeois Gentleman: it was felt how hideous this Fashion was. Thus, until it comes back for mourning, from now until a very long time in the future black undersides will be worn. 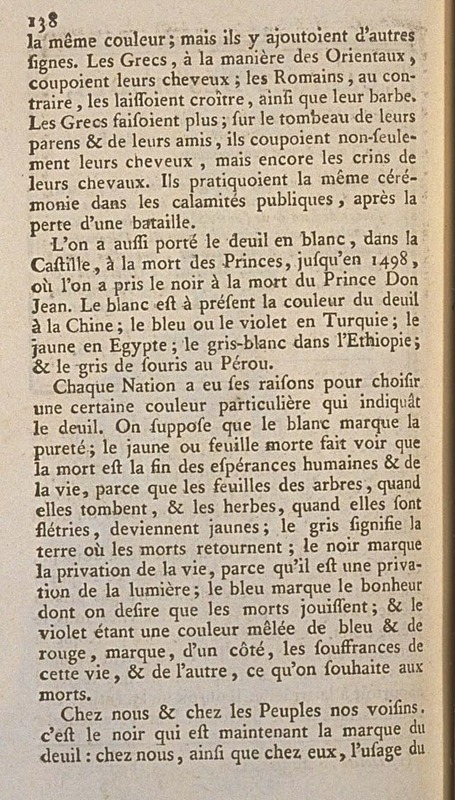 Already even the Newspapers which announce mourning, speak no more of white stockings and embroidered white vests, when they indicate the little mourning. Women wear, in the first period, black silk gowns, trimmed with the same, or black gauze; hats, gauze, and diamonds. 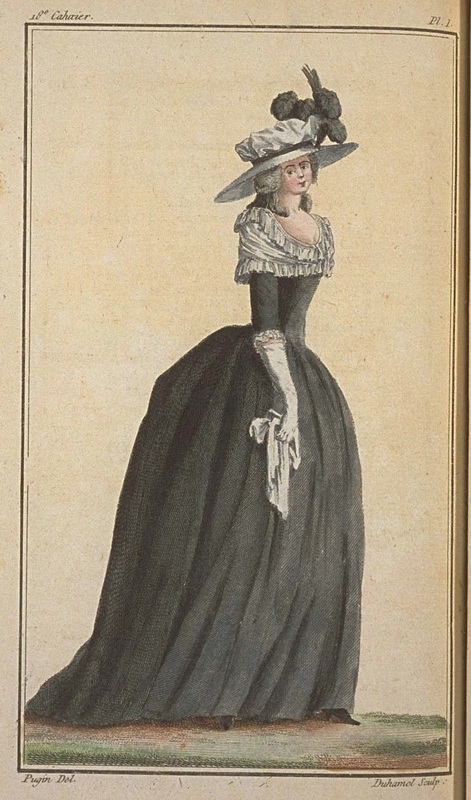 A very-great number wear a white muslin gown, with a black petticoat and a black stomacher, chapeaux-bonnettes and diamonds, or gauze caps and black and white plumes. In the second period, they wear gowns of white silk, plain blue or pink ribbons, gauze, and diamonds. A very-great number vary this dress. 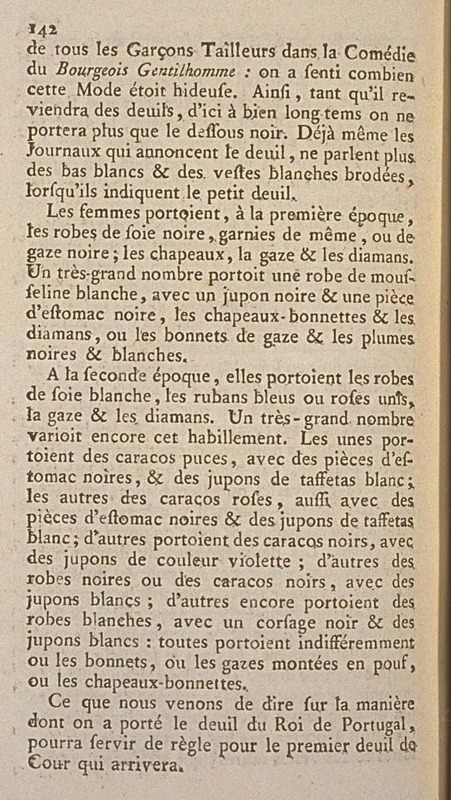 Some wear puce caracos, with black stomachers, and white taffeta petticoats; other pink caracos, with petticoats of violet color; others black gowns or black caracos, with white petticoats; still others wear white gowns, with a black bodice and white petticoats: all indifferently wear caps, gauze made into poufs, or chapeaux-bonnetes. What we have just said on the manner which morning was worn for the King of Portugal, will serve as a rule for the first mourning at Court which will come. We have represented in the Ist PLATE, a Woman wearing mourning following the first period. She is dressed in a gown of black taffeta. The petticoat matches the gown. On her neck is a kerchief of white Italian gauze, with large frills. The manchettes of her gown, made in sabots, are also of gauze, like the kerchief. Her head is covered with a chapeau-bonnette of white crêpe, wrapped with a wide black ribbon, and surmounted with four black plumes. Her hair, in the back, is tied very low in a large cadogan, held with that bronzed iron ligament, of which we spoke in the previous Book. Two large curls on each side fall on her chest. her shoes are of black taffeta, and are frilled with a black ribbon all around.